So, I have a question for all you active people out there. I am trying to decide if I should get a Fitbit or a HRM….or both? I am thinking I eventually want both, as they seem to have different features that everyone likes. I have done some research on both products. It seems the general consensus is that the Fitbit is great for all day every day activity. That overall, people that use it become more active because they want to say their steps per day increase and such. It is great for tracking walking/running…but not so much at biking or weight lifting work outs. It is up in the air with the elliptical machine. Some people say that it tracks it perfectly, others say it doesn’t work as well because of the smooth motion of the elliptical and it isn’t tracking the elliptical’s resistance. The more expensive versions of the Fitbit also track sleeping patterns, which I find interesting. I feel that most nights I get a pretty restful sleep…but I would love to see what kind of tracking I would have. Research shows that the HRM is great for cardio activity and other work outs, but you wouldn’t want to wear it 24/7. It seems that the HRM is going to be more accurate for calories burned during a workout. I would definitely want one that shows the calories burned. I am sure that both of these are great options for fitness, but I am wondering if any of you have an opinion on either and how they work for you. If you have a HRM, which brand and model did you purchase? I have a fitbit and a HRM. I like them both but I LOVE my HRM. 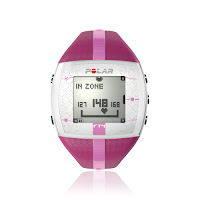 I have the polar Ft4 and it gives me a very accurate burn level during my workouts that the fitbit couldn’t do. haha Nadine! I feel like an idiot I didn’t know what either of these gadgets were lol thanks for teaching me! I got the Flex (you wear it on your wrist) It is back ordered and I haven’t received mine yet. But I’m so excited to see what it does!